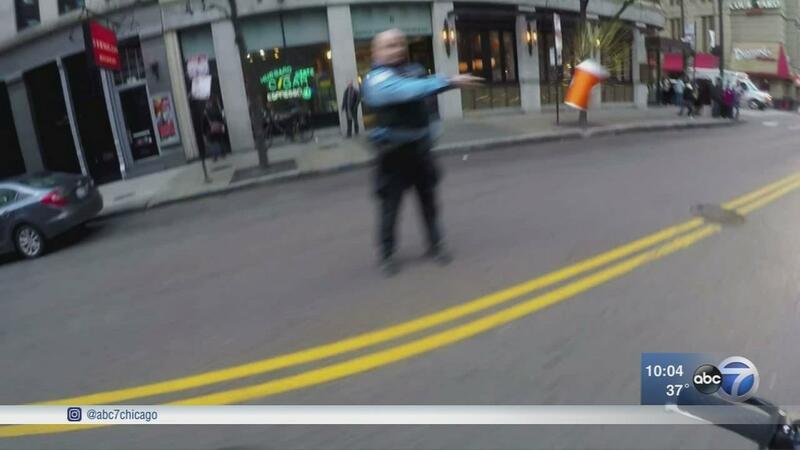 Chicago police have suspended an officer who was caught on video throwing a cup of coffee at a passing motorcyclist who shouted at him near a downtown intersection, officials said. The incident happened Jan. 20 and city officials learned about it Monday after news stations obtained the video and sent it to the department’s communications team, police said. The recording, posted by a Facebook group called Chicago United Riders, appears to have been taken from a helmet camera and shows a group of bikers riding east on Hubbard Street toward State Street. The leader of the pack, in front of the camera, is riding a wheelie — on his back wheel only. The rider taking the footage raises his left hand and shouts something indiscernible at an officer, who is standing on the other side of a solid yellow line and appears to be waiting to cross the street. The officer then throws a cup of coffee underhand at the rider. A police spokesman confirmed Friday that the police officer, Robert Markvart, has accepted a five-day suspension. Police Superintendent Eddie Johnson said earlier this week he could not defend the officer’s actions.